Emmanuel Sanders is a renowned wide receiver for the NFL’s Denver Broncos. The talented NFL player has never ceased to prove himself over the years since his draft. He has also had his presence duly felt at the Pittsburgh Steelers where he exuded great tenacity from season to season. From all the questions that have gone unanswered about him, here’s all you’d love to know about Sanders. The Broncos player was born on March 17, 1987, to his parents in Bellville, Texas. While growing up, he had a passion for football but was also very good at other games too. Sanders was a popular basketball and baseball player in Belleville High School, Texas where he had his high school education. He was also good in track. Sanders started his high school career as a first-team All-District performer, playing as running back, safety, and wide receiver. He made a record of 49 tackles and three interceptions as a senior and also recorded 499 yards and six touchdowns. He earned the title of the Team MVP as well as the Tri-County Offensive Player of the Year after his senior season. On the heels of his very successful high school stint, Sanders who was already popular had football scholarship offers rolling in from different schools but chose to settle with Southern Methodist University. He had a good freshman year but recorded 67 receptions for 988 yards with 9 touchdowns in his junior year. He got even better in his senior year with 98 receptions for 1,339 yards with seven touchdowns. Emmanuel Sanders went pro in 2010 when he was selected by the Pittsburgh Steelers in the third round of the 2010 NFL Draft as the 82nd overall pick. In June that year, he signed a three-year $1.80 million contract with the team and also bagged the sum of $586,000 as his signing bonus. He was subsequently named the fifth wide receiver for the team. Sanders, alongside teammates Wallace, and Brown, were collectively called ‘Young Money Family’ by fans with Emmanuel earning the nickname ‘Easy Money’. He made impressive records in his first season with the team until towards the end when he fractured his foot at Super Bowl XLV. He subsequently underwent a surgery in the 2011 season and missed the first preseason games. After his recuperation, he recorded five receptions for 46 yards and a touchdown during the game against Arizona Cardinals. He was, however, withdrawn again after undergoing a knee surgery which caused him to miss more games. Sanders played for the Steelers until 2013 when he became a free agent. In 2014 he signed a three-year contract worth $15 million with the Denver Broncos. At the end of the 2015 season, Sanders who had become very popular in the team was ranked 74th by his fellow players on the NFL Top 100 Players for 2016. The 2016 season started with a three-year $33 million contract extension for Sanders with the Broncos. The talented player also pocketed a whopping $10.75 million as his signing bonus. He continued to justify his extension that season and in the 2017 season. Not much is known about the father of the popular NFL player but Emmanuel Sanders’ mother is known as Stephanie Sanders. It was indeed a sad and mournful period for him in 2011 she died at the age of 41. Emmanuel is an older brother to his two sisters; LaSabria Sanders and Precious Williams. 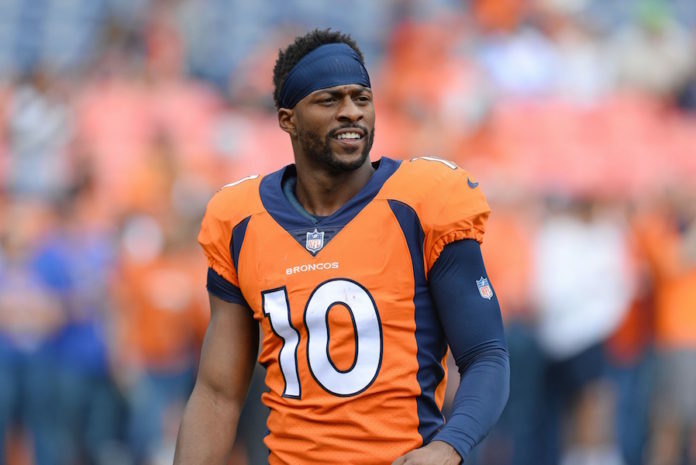 Emmanuel Sanders may seem so entangled with his professional career but like his counterparts, he has got some love stories to tell. He is married to his long-time girlfriend Gabriella Waheed. The couple tied the knot in 2013. Sanders and Waheed have two children together; Princeton, who was born in 2014 and Zoie born in 2016. The couple became a topic of discussion on various media platforms in 2017 after it was reported that Gabriella filed for a divorce from Sanders on grounds of infidelity. But so far, there’s been no news about the divorce being finalized. Emmanuel Sanders has got a good body that suits his daunting career. He may not be the tallest but has a strong stamina and a sturdy body build that gives him all the support he needs. He stands at a height of 5ft 11in (1.80m) which is quite proportional to his weight of 82 kg (180 lbs).